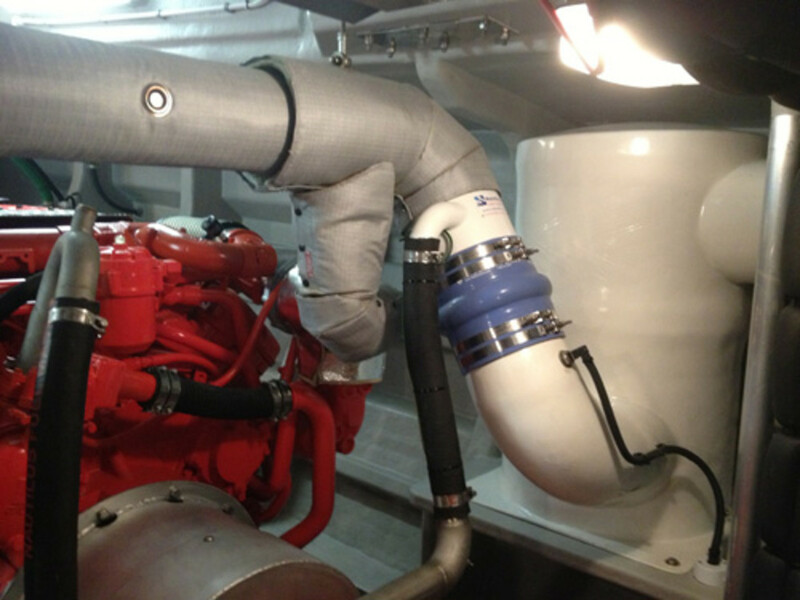 Custom exhaust systems designed, engineered and manufactured by Manuflex Ltd. in partnership with Centek Industries are providing sound attenuation aboard two fast pilot launches built by Goodchild Marine of the United Kingdom for Estuary Services Ltd. Both vessels operate from Ramsgate, supporting Thames pilots in the busy southern North Sea and Thames estuary. Estuary Elan was the first of its design by French naval architect Pantocarene to be built in the U.K. by Goodchild Marine. Formally handed over to Estuary Services at Seawork 2012, Estuary Elan incorporated a planing hull and beak bow design, which allows for stability and higher speeds in rough seas. Ian Mereweather of Manuflex and Bert Browning of Centek Industries worked together to offer a service to meet the specific needs and requirements of Goodchild Marine and its customer Estuary Services. The result was a combination of stainless-steel risers with insulated jackets and supports, along with 8-inch by 10-inch dual stage Vernalift mufflers with a white gelcoat finish.